Ooo gitu Mas, ya sekalian saya mikir nih full rangenya bagaimana. speaker fullrange bisa cover bass, midrange dan treble dalam satu driver. contoh: lowther, mark audio, jordan, fostex. mereka gampang aja merepro 40 hz smpai 20 khz, tergantung desain box/tuningnya. tapi ya itu...fullrange itu area home audio dimana watt dan spl kecil. dispersinya pun gak lebar / beamy. kalao di dunia sound system ada yang mengklaim produknya adalah driver full range, berarti ajaib benar! A full-range driver is designed to have the widest frequency response possible. 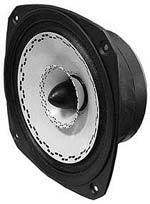 These drivers are small, typically 3 to 8 inches (7.6 to 20 cm) in diameter to permit reasonable high frequency response, and carefully designed to give low-distortion output at low frequencies, though with reduced maximum output level. Full-range (or more accurately, wide-range) drivers are most commonly heard in public address systems, in televisions (although some models are suitable for hi-fi listening), small radios, intercoms, some computer speakers, etc. In hi-fi speaker systems, the use of wide-range drive units can avoid undesirable interactions between multiple drivers caused by non-coincident driver location or crossover network issues. Fans of wide-range driver hi-fi speaker systems claim a coherence of sound, said to be due to the single source and a resulting lack of interference, and likely also to the lack of crossover components. Detractors typically cite wide-range drivers' limited frequency response and modest output abilities (most especially at low frequencies), together with their requirement for large, elaborate, expensive enclosures—such as transmission lines, or horns—to approach optimum performance. The term "loudspeaker" may refer to individual transducers (known as "drivers") or to complete speaker systems consisting of an enclosure including one or more drivers. To adequately reproduce a wide range of frequencies, most loudspeaker systems employ more than one driver, particularly for higher sound pressure level or maximum accuracy. Individual drivers are used to reproduce different frequency ranges. The drivers are named subwoofers (for very low frequencies); woofers (low frequencies); mid-range speakers (middle frequencies); tweeters (high frequencies); and sometimes supertweeters, optimized for the highest audible frequencies. The terms for different speaker drivers differ, depending on the application. In two-way systems there is no mid-range driver, so the task of reproducing the mid-range sounds falls upon the woofer and tweeter. Home stereos use the designation "tweeter" for the high frequency driver, while professional concert systems may designate them as "HF" or "highs". When multiple drivers are used in a system, a "filter network", called a crossover, separates the incoming signal into different frequency ranges and routes them to the appropriate driver. A loudspeaker system with n separate frequency bands is described as "n-way speakers": a two-way system will have a woofer and a tweeter; a three-way system employs a woofer, a mid-range, and a tweeter. @nashwa:biasa ya woofer biasa.jadi klo dah beli yang full range ga usah beli tweeternya ya? oh ya harganya pasti 2x lipat sama yang biasa ya? Kalo speaker 1230 memang gak bisa sempurna ngeluarin nada. Low, mid dan high nya serasa pas2 an. Emang sih, pas juga sama harganya. maka dari itu disusun dari material logam. mbak, saya spet box kalo gak pake tiner gak keluar, tapi kalo pake tiner kok gak bisa textur ? Hampir semua cat bisa dibuat texture, tergantung teknik pengecatan. Kalo gak keluar di nozle berarti terlalu kental. Kalo gak bertexture berarti terlalu cair.